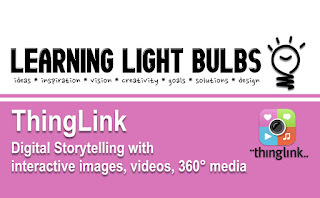 Learning Light Bulbs: ThingLink: A media-rich tool with endless classroom applications! ThingLink: A media-rich tool with endless classroom applications! If you're into app smashing - the practicing of using multiple apps to create projects or finish tasks - then you will love media-rich ThingLink. (your students will love it as well) Teachers and students can easily create interactive infographics, maps, their own (scanned) drawings, as well as 360 videos. Create audio narration, images, videos, and quizzes. Why not take students on a 360° virtual field trip to a place outside of your country? ThingLink is available on smartphones, tablets, and desktop/laptop computers. You can easily create projects that connect to developing digital literacy skills and addressing Common Core reading and writing standards, ISTE, and others. Remember - it doesn’t have to be 360°! Click the image for a tutorial video, and then check out some of the ideas below. Click the image for a tutorial video. Here are a few of my ThingLink tours. Note the YouTube, image and text integrations. Create virtual tours of places. Create a campus map. Use icons to show if a hotspot is a video, or a particular kind of information. Create a kind of ‘hyperdoc’, but with a media-rich platform. Create an interactive map of your community with popup images. Take a screenshot from Google Earth and use it as your base. Curate online resources for a project. Create a timeline of events in a story or event in history. ThingLink is also updating regularly and has a new Tour Creator feature.